Comics, old time radio and other cool stuff: The Whole Town is Dead! When I was a little 'un, the scene shown in the picture above was one of the coolest things I'd every seen. Steven Austin--the Six Million Dollar Man--used a big metal fence post with its concrete anchor still attached as a javelin to take out the truck containing a super-weapon. I loved it. 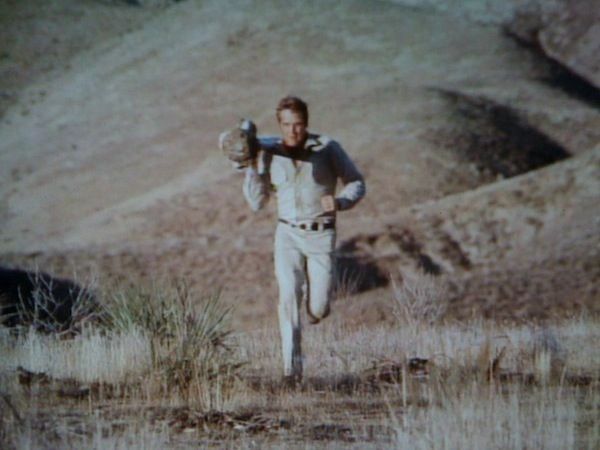 The Six Million Dollar Man (based on the novel Cyborg, by Martin Caidin) came to TV with three made-for-television movies that aired during 1973. It became a regular hour-long show on January 18, 1974 with the airing of "Population Zero," in which Steve gets his chance to throw that make-shift javelin at the bad guys. It was the beginning of a five-year run. Science fiction on television in the 1970s being what it was, it had its share of silly episodes. But "Population Zero" gave it a strong start as a regular series. It was a tautly written by Elroy Schwartz, whose long list of credits as a TV writer include both dramas and comedies. It had strong moments of suspense and several nice character moments for Steve Austin (Lee Majors). If that scene doesn't grab your attention, then nothing will. So everyone in the town seems to be dead and anyone who also goes in is also hit by whatever it is. 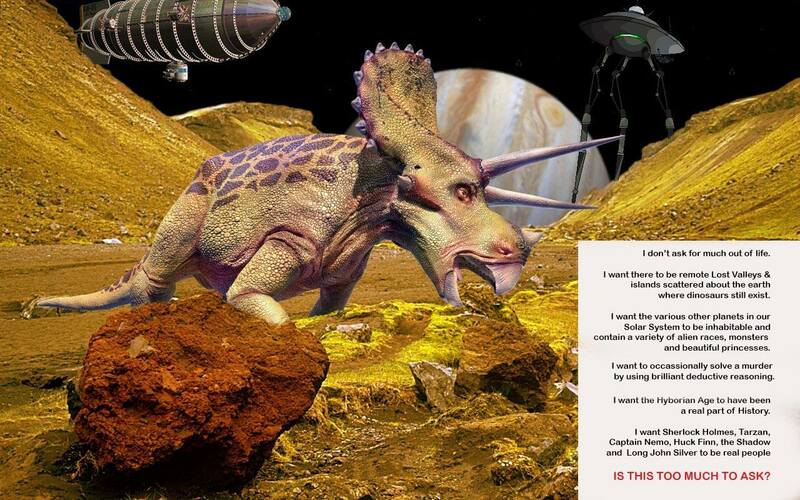 Eventually, Steve Austin walks in while wearing his old space suit, but by then the people are starting to wake up. They were merely unconscious. They were victims of a sonic weapon and the bad guys are soon threatening to amp up the volume and commit mass murder if they aren't paid ten million dollars. The government refuses to pay up, but Steve lets himself get captured by the villains in hopes of stopping them. Technically, I suppose that Steve falling into the hands of the villains represents 60% of what they asked for, but they don't see it that way. They plan to wipe out an Army battalion to prove they're serious. Steve is locked in a big freezer with a door too thick for him to simply kick down even with bionic limbs. The logic is that he would be around if something goes wrong with the mass murder attempt, they would still have Steve as a hostage. If everything works, Steve will eventually freeze to death and no longer be a problem. In addition to the well-constructed and straightforward main story, the script really does give Steve some strong character moments, such as getting short-tempered when an army doctor asks him about his bionics. He's simply gotten sick of being an object of medical curiosity. Another good line is when someone asks him if his boss Oscar Goldman (played by Richard Anderson) is indeed his boss. Steve replies: "He thinks so.... No, that's not fair. He's bright, straight and underneath that shell of red tape, he's even got a heart." Anderson--an excellent character actor--was already giving Oscar a definable personality and dialogue like this helped this along and set up his eventual close friendship with Steve. There's a nice attention to detail present in the episode as well. 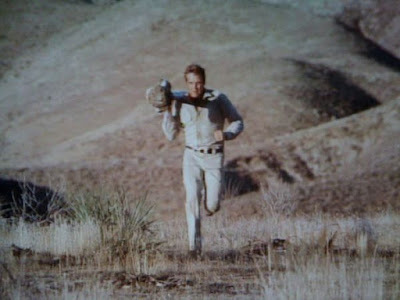 For instance, when Steve is running through the desert with that fence post, his real left arm is soaked in sweat, while his bionic right arm is bone dry. But the thing I remembered most from first seeing this as a kid was Steve throwing that fence post through the villains' truck. The heck with subtle character moments. The fence post javelin was the really cool part!